My fear is that the overwelmingly white and male American blogosphere, hell bent (in some quarters) on replacing the current ranks of professional journalists with themselves, will return us to a day where the dialogue about issues was a predominantly white-only one. So how do we get more diverse voices into the blogosphere? I'd like to hear more suggestions from non-white as well as non-American bloggers. Hey Rebecca - you may be white but you're not male are you? Let's hear from you the non-male. Also - I would argue that the problem with old MSM was (largely) regional: ABC CBS NBC were all headquartered in the northeast, NYC to be exact. That's where the "elite" charge gained traction. And where is this conference being held? Is this one at Harvard? Race and region both need to be represented IMO. I would advise some of the power bloggers and bloggars (that's my male/female blogger distinction this week) to perhaps read some more diverse blogs and maybe even (gasp) add some to their blogrolls. Gasp. They'll be discussing some of this at SXSW. I am white, female, non-American and non-anglophone (French Canadian). I write a bilingual blog, alternating between posts in French and in English (I do not translate my posts). I have a decent size readership for a bilingual blog but I am sure that the fact that I do not blog entirely in English "hurts" my stats. I have made the conscious choice to write in two languages because I hope for more diversity on the Web. Still, just about every blogging contest or other kind of Web awards I see - which are mostly silly but can sometimes increase traffic to a blog - are geared towards blogs posted in English. The non-English blogs are all piled up into a single "non-English" category, regardless of their subject matter. I know that I am read by non-French speakers because they leave comments on my blog, even when I post in French. They are mostly from Canada, Europe or Latin America. Seems like it's mostly Americans who resist the use of translation tools and turn around when they find a blog that's not written in English only. Perhaps better translation tools will eventually help out non-English bloggers to get more attention? Hey, Rebecca = I'm so glad you mentioned this in the conference and I threw down the gauntlet to some of the bloggers right there in the room -- Jay Rosen, Jeff Jarvis, David Weinberger, Susan Mernit, you, me -- that we should have a race to see who can promote, teach, sign up, blogroll TEN NEW BLOGGERS WITHIN THE NEXT MONTH who are not white and not male. I'll blog about this. Jeneane you're RIGHT ON about the BLOGGING WHILE BLACK conf at SXSW next weekend. I won't miss it. BTW, there are two conferences next week -- O'Reilly's Etech and SXSW -- and may I say I think O'Reilly's list of speakers -- notice on their homepage -- 20 men 1 woman -- is representative of the population on some planet -- not EARTH of course -- but perhaps MARS. Go to SXSW -- a much more diverse group. Here is my two cents worth regarding blog diversity. (First a disclaimer, I’m a white male.) This is a non-issue. As of now, there is damn little preventing anybody from starting a blog. The barriers, however that is defined, regarding cost, access to technology, gender,race, intellect, sexual orientation, physical impairments have plummeted. All you need is a computer, access to the Internet and motivation. The software is free for crying out load! Starting a blog is probably the ultimate exercise in egalitarianism. Getting noticed and developing a readership is another matter. What’s next, an affirmative action program for wanna be bloggers of color? Sarcasm aside, this debate reeks of naval gazing. Perhaps focusing an the rise of blogging as a global multicultural phenomenon might be more fruitful otherwise the next issue will be something like what are we going to do about the preponderance of Chinese bloggers in China? Brad, the concept of reducing this to an affirmative action argument misses the point. In the first place, getting a computer and internet access is still a huge barrier for the majority of the world's population, including a significant number of people in the so-called developed world. I used to think people chose journalism as a profession, because they wanted to write. Over the years, this belief has been debunked. Some do. Many do not. Many, as Weinberger writes, chose their profession out of a commitment to their ideals. Some are closer to mine than others. Regardless, I respect the commitment and I agree with Weinberger. While many of us will enhance our view of the world with personal accounts gleaned from the blogosphere, for the foreseeable future, the journalists will shape how the masses learn about our world. i agree with keith on this one. the problem is less with who's blogging than the fact that mainstream media is listening to bloggers too much. i suspect mainstream journalists follow blogs that reflect their interests. so when they allow these interests to shape who and what they cover, the agenda has been shifted. the blogosphere greatly distorts perception. mention "blog" to most people, and you'll be greeted with a puzzled look. we're still only a couple percent of internet users. so it seems that bloggers have disproportionate influence on who and what gets discussed. in the case of political blogs, that has very real implications for agenda and policy-setting. I appreciate the sincerity of your comments; I do not find them applicable. I’m not “reducing this to an affirmative action argument” but I think others may wish to. The fact that Internet access is not universal to everyone is not the issue at hand. The majority of the people on earth do not have access to clean drinking water let alone the Internet. Clearly there are more pressing issues than Internet access. If one considers, however, the unprecedented velocity in which the Internet, as a channel for information, commerce and communication, is altering the dynamic of human interaction, there is room for optimism. Let’s look at one part of, as you say, “the so called developed world.” 204.3 million Americans have Internet access from their homes. That’s 204.3 million potential blogs. The ethnic and demographic barriers to Internet access have fallen dramatically in the last decade. As a tool of commerce, new users, in 2000 took an average of 18 months before purchasing online. That interval has disappeared; economic transactions take place literally the day access begins. Furthermore, new users jump right away into the news, information, educational and job related page views. The issue may be why aren’t more of those 204.3 million Americans starting blogs? They could start them. Perhaps they don’t know how, but it’s getting easier all the time. Perhaps they don’t want to, that’s their prerogative. India, China, the statistics speak for themselves, are getting more plugged in all the time and in fact Asia leads the US in broadband access. 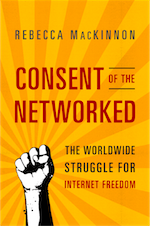 Internet access can be restricted or denied for a variety of reasons. You say technology and cost is a huge barrier. I would say that political, social and religious constraints cannot be discarded when considering this issue. Take the petroleum based regimes of the Middle East, plenty of wealth there. The people of the Middle East have been denied access, for the time being, by their rulers and their culture for political and religious reasons. Your analogy regarding access to a printing press is misplaced. I’ll skip over the impact of moveable type, the rise of itinerant print providers in Europe during the 1500’s and the effect of the printed pamphlet on the issues of that era and I’ll ignore the proliferation of pamphlets during the founding of America, and just note that the desktop printer is widely available, at bargain prices. In fact, let’s look at print and the explosion of self-publishing. The number of new book titles, in the USA, jumped from about 50,000 titles in 1985 to just fewer than 100,000 in 1990, to 150,000 titles in 2002, to 175,000 titles in 2003, and then to about 200,000 titles in 2004. At the same time, the number of publishers jumped to more than 78,000 from well under half that in 1985. Sounds like a whole lot of diversity is going on in print publishing. Can the same be said for the Internet? I believe it can. If as some say, blogging suffers from a preponderance of the dreaded white male, it is simply because they were early adopters whose statistical predominance will fade. The ominous allusion to a cabal of influential people making “decisions that effect the connected and unconnected alike.” ignores that fact that there has always been a cabal of influential people making decisions that effect the connected and unconnected.But things have changed. The Orange Revolution in the Ukraine was blogged by Ukrainians. I think the Ukrainian bloggers were Caucasian, should we be concerned? The world is more interconnected than it has ever been, period. Access to views other than one’s own, have never been more plentiful, period. More people have the opportunity and the ability to reach out to the world than ever before. That’s not too bad for an imperfect world. I may be mistaken, but wasn’t it a group comprised mostly of white males, working with the military and the government that created what became the Internet. Boy, they sure let that cat out of the bag on that one. I guess I am confused as to why you seem to equate raw numbers with diversity? The two rarely match up as you seem to imply. Again, we are not talking about just counting heads, its about factoring in experiences. We are also not 'dissing the white man'; we are saying that it is important to make sure other opinions are brought to the table as well. Stating that there were 200,000 new titles published in 2004 is not the same as saying that they represent 200,000 different experiences or points of view. How many were published by women? How many by people with disabilities, how many by people of color? What might we learn from one of those authors that we could not even imagine given our own set of experiences? My point, and I think the point of some of the others in this discussion, is that it's our responsibility, as privileged members of society, to find these things out and then to seek out those whose voices are not part of mix. It is a viewpoint that doesn't say 'I have mine, you can get yours too', but rather, 'I have mine, let me work with you to get yours and perhaps together they can be better still'. Again, this is not about giving everyone an internet connection and saying 'job done'. Access to blogging tools is not the issue, access to information is. 200,000 titles produced by a limited set of voices, produces a limited amount of information; 500,000 titles would do the same. The question is, are we doing the best we can to produce the best, most useful amount of information possible. In Europe, the power of the printing press can be seen in the 18th century as well. During the French Revolution, as publishers like Jean-Paul Marat increased their power, they began to limit dissent. They published alot, unfortunately it was all from their own point of view - and anyone opposed to it quickly became fodder for Marat's loyal, well informed readers. Publishing yes, diversity of opinion, no. So again we return to the basic point, are the bloggers who feel they are ready to step into the breach and replace MSM offering up something better, or just repeating past mistakes? History, unfortunately, is full of examples where hoping for a good outcome, based on 'the numbers', was simply not enough. Today, as this medium is beginning to take shape, we have an opportunity to affirmatively move it in a better direction. That direction must include all people in order to be true to the potential of the internet, the world wide web and what ever is to come. Replacing one limited set of ruling voices with another only succeeds in carrying forward the mistakes of one era into the next. Using our positions to give voice to the voiceless, however, upholds the best tradition of what being a journalist and a citizen, of any era, is all about.